KKVB STORY - read here! Finally we found a gardener, his name is Roy. He will be in the garden at leat three days a week. On Thursday, Friday and Saturdy, from 12.00 up to 18.00. He is really committed to the garden. PUBLICATION The Cook, the Farmer, his Wife and their Neighbor IS NOW OUT!! Marjetica Potrc and Wilde Westen welcome you to join the house warming party taking place on Saturday 18th April 2009, in Lodewijk van Deysselstraat 61, from 15.30 to 19.00. Read also what our friends of Freestate SWOMP are saying about us! 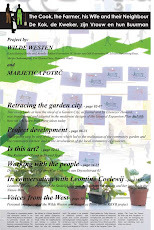 The Cook, the Farmer, His Wife and Their Neighbor, a participatory project by the Slovene artist and architect Marjetica Potrc and Wilde Westen - a group of young designers, architects and cultural producers -, combines visual art and social architecture to redefine the village green. 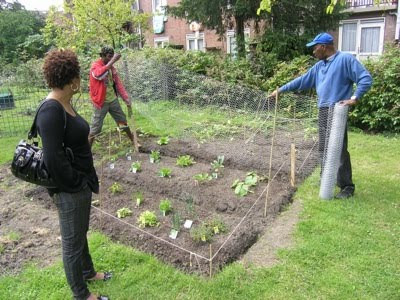 Community vegetable gardens become a tool by which the residents of Amsterdam Nieuw West reclaim ownership of their neighbourhood at a time when demolition and redevelopment are causing many to feel uprooted. In the 1950s, the garden city of Nieuw West was constructed on former farmland as a modernist project; today this Amsterdam suburb is one of the largest residential redevelopment sites in Europe. With their project The Cook, the Farmer, His Wife and Their Neighbour, Potrc and Wilde Westen, in collaboration with the residents of the multicultural Geuzenveld-Slotermeer district, reflect on this history and celebrate a return to local food production. Here, farming and cooking are viewed as a way for people to share knowledge and traditions, and a means for the cultural renewal and rebirth of the neighbourhood. Beginning April 18, 2009, the house at Lodewijk Van Deysselstraat 61, in Slotermeer, will be a meeting point open to the Cook, the Farmer, his Wife and their Neighbours, friends and guests, as well as those involved in the many local initiatives already taking place in Nieuw West. 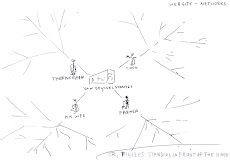 The project is realized in collaboration with Stedelijk Museum in Amsterdam, within the initiative Stedelijk Goes West. The Cook, the Farmer, his Wife and their Neighbor is a collaborative project in the Nieuw West neighborhood of Amsterdam; initiated by the Stedelijk Museum in Amsterdam, it was designed and organized by Marjetica Potrč and Wilde Westen, a group of architects, artists, designers and cultural producers. The project consists of a community vegetable garden and a community kitchen, which are used by residents of the neighborhood and which, we hope, will remain in place even after the Stedelijk program comes to an end in September. 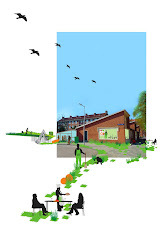 We see the opening of the project on April 18 as the start of a process of transformation for the neighborhood: the garden and the kitchen provide the people who live in the area with a way to redefine their relationship to public space and the public sphere. A previously unused site at Lodewijk van Deysselstraat 61 was acquired on a temporary basis from the Far West construction company; the building that houses the community kitchen also serves as a meeting place, and the vegetable garden is located behind the kitchen. A grant from the Netherlands Architecture Fund allows us to present the community garden and kitchen as a case study in a publication that re-imagines the role of green spaces in the Dutch garden city, a modernist planning model developed in the postwar years. The project has tremendous potential: not only are we working closely with residents to redefine the public space, but we are also acting as mediators between residents and the municipality authorities to change the way public space is perceived and managed in Amsterdam. Amsterdam’s Nieuw West neighborhood is a famous modernist development that was conceived by architect Cornelis van Eesteren before World War II but constructed after it. Today, immigrants from Turkey and Morocco account for more than half of area’s population. The problems and challenges the neighborhood faces are the same as those of aging modernist residential developments throughout the European Union – in particular, unemployment and the non-integration of recent arrivals. Nieuw West is, moreover, one of the largest residential redevelopment areas in the EU, a situation that has led to the continual resettlement of families: when immigrants are forced to move a second time, it becomes especially difficult for them to build community. The vegetable garden helps give residents a sense of connection to place as they work the land in a neighborhood that experiences constant population shifts. Both the garden and the community kitchen create bonds within the community (residents give the kitchen half of their produce from the garden) and become a catalyst for transforming not only the public space but also the community itself. A mere half-century ago, the area of Nieuw West was farmland. The postwar modernist garden city included large green public spaces, which, however, eventually turned into no-man’s lands, dividing and alienating the residents. Some of the green spaces were fenced off and the residents were not permitted to enter them, thus signaling the death of modernist planners’ ideal of a shared democratic space. The project The Cook, the Farmer, his Wife and their Neighbor opens one of these fenced-off yards to residents, who reclaim the space by growing vegetables on its land. The project uses horticulture and the different cuisines of the multicultural neighborhood to create stronger community ties and build firmer relationships between the residents, the space, and the greater society. On a larger scale, the project redefines the relationship between rural and urban knowledge. After the predominant status of urban culture in the late twentieth century, societies today are redefining the urban–rural relationship for a variety of reasons. The European Union faces challenges that arise from the aging of the population and increasing migration. The old administrative unit of the national state, a concept inherited from the nineteenth century, is being transformed into regions with the emphasis on the local. More generally, the EU, like the rest of the world, is having to develop strategies that address global warming and, most recently, the economic crisis of 2008. All these things demand the involvement of citizens in redefining the social contract and creating a new understanding of citizenship. The Cook, the Farmer, his Wife and their Neighbor is an example of both “redirective practice,” where people from various disciplines and backgrounds come together to forge new knowledge, and “participatory design,” in which the people who are most directly affected – the residents of Nieuw West – are themselves involved at all stages of the project’s development. The project brings together neighborhood residents, individuals and groups (Marjetica Potrč, Wilde Westen, and many other organizations), and institutions (the Stedelijk Museum, Far West, the Netherlands Architecture Fund, etc. ); by being involved in the project they create positive change in the neighborhood and redefine how we live together. We look forward to seeing the project develop and expand to other communities in Amsterdam and beyond. It’s all about social architecture! she has been invited by Daniel Birnbaum to display a large selection of her drawings at the Venice Biennale this year. Potrc won the prestigious Hugo Boss Prize in 2000 and exhibited her work in the accompanying exhibition at the Guggenheim Museum in New York. Wilde Westen is a collective group of young designers, architects and cultural producers. By combining different disciplines they initiate open, dynamic and participatory processes that respond to urban and social needs of cities in transition. Their interdisciplinary work is focused on reactivating urban spaces by involving inhabitants in order to reimagine urban renewal and how we live together]. Their latest project is The Cook, the Farmer, his Wife and their Neighbor, which is realized in collaboration with Marjetica Potrc and is about a community garden and a community kitchen in Amsterdam West (The Netherlands). The members of Wilde Westen are: Lucia Babina/iStrike.ultd, Reinder Bakker and Hester van Dijk/ Overtreders-W, Merijn Oudenampsen, Eva Pfannes and Sylvain Hartenberg/Ooze and Henriette Waal.